от 1000 шт. — 39.80 руб. 85 руб. 5 дней, 766 шт. 1 шт. 7 шт. от 60 шт. — 47 руб. 100 руб. 3-4 недели, 495 шт. 1 шт. 1 шт. от 25 шт. — 99.90 руб. The TAJ series from AVX offers a wide range of general purpose, SMT chip tantalum capacitors. 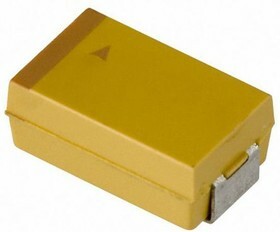 These robust capacitors have a CV range 0.10-2200μF / 2.5-50V and are available in 17 different case sizes. AVXs TAJ capacitors have a J-lead construction and are an excellent choice for entertainment systems and general low power DC/DC applications.